For customers who want their potatoes on the burger—not piled off to the side—the Easy Slider food truck is the place to go. 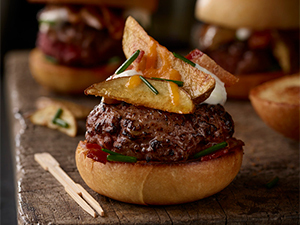 Chef Perrini tops beef sliders with thin wedges of crisp baked potatoes, then treats them to classic garnishes of sour cream, grated cheese, chives and cooked bacon. 1. Preheat oven to 425 F. Prick potatoes a few times with fork and place on baking sheet. Bake 45 to 60 minutes until skin is crispy and potatoes are tender. Once cool enough to handle, slice each potato into thin wedges. 2. Preheat griddle over high heat; lightly oil griddle. Toast each brioche bun half and set aside. 3. Season beef patties with salt. Cook each patty on griddle to medium-well, about 6 minutes total, flipping once. Just before patties are done, top each with 3 potato wedges and 1 tablespoon grated cheddar; allow cheese to melt. 4. Remove from patties from heat; place on bottom of brioche buns and top with sour cream, chopped bacon and chopped chives. Serve open face.